REGION: USA/Canada THE NEED: Hunger isn’t a problem just in developing nations. Millions of Americans and Canadians are struggling to put food on the table for themselves and their children. These are families and individuals in urban cities, rural towns, and suburbs. 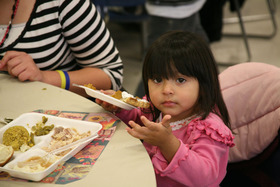 In fact, one of every five children in the United States lives in a home where consistent meals are hard to come by. The problem in North America isn’t lack of food—it’s lack of money to buy the food that is available, and with high unemployment rates, the problem is growing worse. But Nazarene churches and compassionate ministry centers (CMCs) across North America are reaching out to meet the needs of the hungry in their own communities. They are sharing the love of Christ by sharing their own resources, and they’re offering dignity, hope, and courage to those who receive. • Food Pantries and Grocery Assistance: Food is provided to thousands and thousands of families and individuals so that they can cook nutritious meals at home. • Hot Meals: For many in need, the hot meal served to them through a compassionate ministry center is the only hot, nutritious food they will eat that day. • Community Gardens: By helping create gardens, compassionate ministry centers are helping to create food security for today and for the future. • Weekend and Summer Food Assistance for Children: These times are often the hardest for children who may receive meals at school but not at home. • For $25 you can provide a hot meal for 10 people in need. • For $50 you can buy seeds and tools for a community garden. • For $100 you can help to offset the cost of summer food assistance for a child. For more ways to get involved, visit www.nazarenecompassion.org. SUCCESS STORY: In Jacksonville, Florida, Gleaners Dispatch is addressing a problem that many may not understand: Of the 15 percent of Americans living in poverty, most are employed, but they just aren’t paid enough to make ends meet. In response, this CMC is bringing hunger relief to community members with inadequate incomes. Their approach isn’t a traditional food pantry, though. Instead, volunteers collect fresh food from restaurants and grocery stores that would otherwise be thrown away. Then they provide it to single-parent families, senior adults, disabled adults, the under-employed, and people between jobs. Gleaners Dispatch also uses the donations to serve a weekly sit-down meal for the community. Not only are the more than 100 volunteers providing nutrition for families and individuals going through tough times, but they’re also keeping excess from going to waste. All in Jesus’ name. Be sure to put ACM1016 in the Memo area. Thanks for your donation.